Tried them all, this app is the best. I tried many similar apps over the years, but in my opinion, this app is the best one in terms of functionality and quality. I turn it on the minute I wake up; and, the sounds before sleep really do work. I am absolutely hooked. From the first time I used it I could tell the difference in my motivation and stress levels. I especially like to have it playing in the background when I am on a business call. The choices for the background music and sounds give you the opportunity to create what works best for you. I’m a Physician an usually get a lot of Stress and Anxiety thats comes with me to my home after long hours of working and many troubles to solve. This program is fantastic, the music, the sounds, the tones, everything! Thank you for this awsome App. 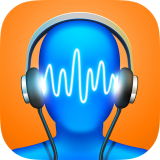 I've been experimenting with different apps, for sleep and stress relief, that employ hypnosis, binaural tones and isochronic tones. This one is the best, for sleep especially and it's the only one that I have found that uses isochronic tones (which are superior to monaural and binaural tones). The ability to tweak the music and sounds is a definite bonus. Works very well. This app inspired me to learn more about its technique of isochronic tone brainwave manipulation, It is real. I have been able to fall asleep much easier than I have in my life, I can gain motivation, it truly just happens if you believe in it, which the science is true. Great app!! Realistic sounds, great surround sound quality, very nicely done pieces of music (these can usually be very bad). The sounds can be listened to in combination and you can save them like that. 10/10. Thanks, devs. RCS Software is a dedicated team of iOS and OSX developers. Our team consists of people from different academic backgrounds and have a broad set of skills. We strive to deliver original and entertaining applications for iPhone and Mac users. We are passionate about our work and we hope that you will like our products. In our work we combine our hobbies, interests and expertise in app development, this allows us to produce top-notch applications that we are proud of. Please contact us if you have any questions or proposals regarding our work. If you encounter any issues while using our applications you can contact our support team.